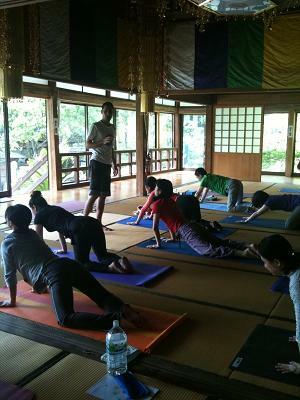 I went to Kumamoto on May 29-30 to do yoga retreat interpretation for Haidar Ali at Nichirinnji Temple. Nichirinji Temple is a Soto Zen temple. My family is Soto Zen so I felt close to the temple. I used to sit in a Zendo in Canada but this was the first time for me to sit in a temple in Japan. I was really looking forward to it! Took 1 and 1/2 hours by car from Fukuoka airport, temple, located in a mountain. Mika-san who runs a yoga studio HUSLABcame to get us. Nichirinnji temple was really nice. The monk was a good person. 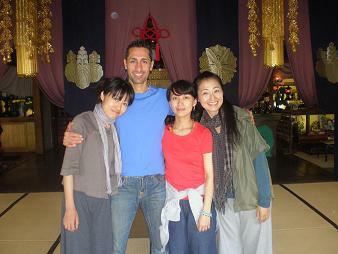 I never had anyone appreciated me as a yoga interpreter as much as them! People can connect with yoga, with themselves, with others and with the universal energy much much deeper by spending 2 days together. We went to hot spring after yoga. Found a huge centipede in my suitcase at night and panicked! We sat for 30 hours each day for zazen. 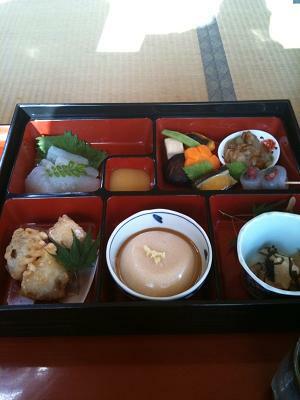 We had Shojin Ryori, vegetarian meal, which was delicious. Such a wonderful retreat and wonderful people.